Fall is officially one week away! 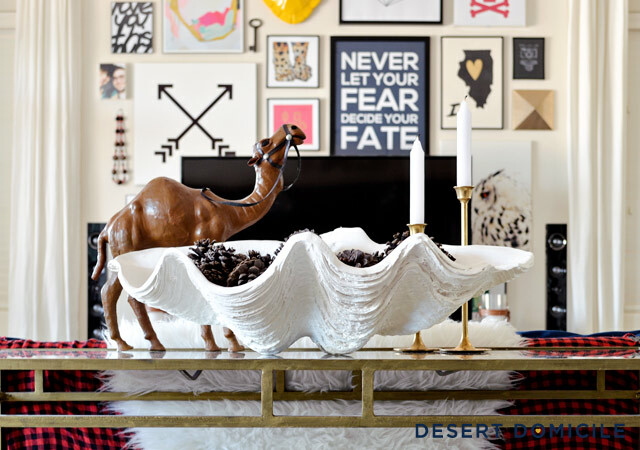 I don't know about you but for me, fall tends to be a tricky season to decorate for. There’s no real “theme” to decorate around like there is for Halloween or Christmas. 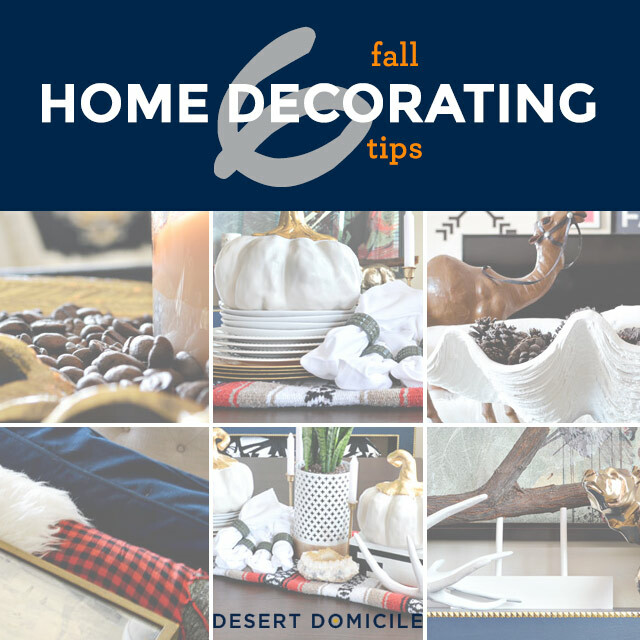 I’ll be sharing my fall home tour with you next week (see 2014’s here and 2013’s here) but I wanted to share some fall home decorating tips with you today in case you have a hard time decorating for the season like I do! 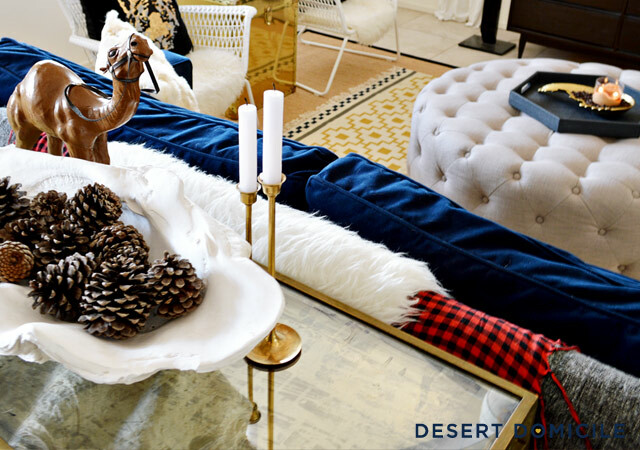 Living in the desert means that we don’t have access to a lot of the typical fall elements you find in nature, like branches and pinecones. Thankfully most stores sell them so I can still add them to my decor! Above I added some birch branches to a clear glass hurricane. I bought the branches off of eBay but I’ve seen them in HomeGoods and Michael’s. Pinecones are great because they’re cheap to buy and the large ones take up a lot of space so you don’t need a ton of them. 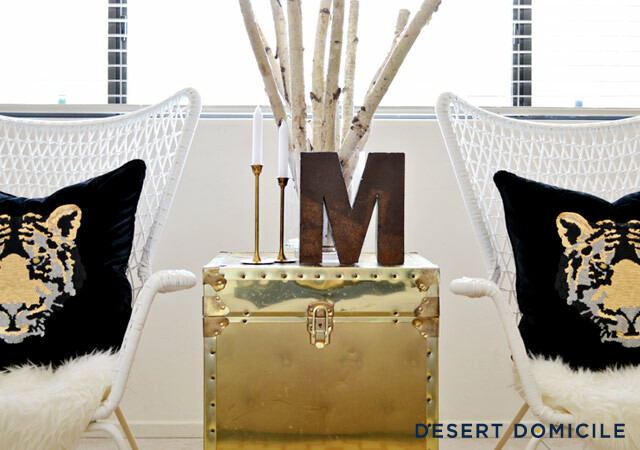 If you don’t live in the desert, you may be able to find some out in nature for free! If you do, don’t forget to “cook” them in the oven to kill any bugs that may be living in them before you put them out on display! I found our branch on the side of the road! I made a base for it using a scrap piece of 2” x 2” wood. I drilled two, equi-distant holes in it for two dowel rods and then I glued the dowel rods in place. I gave everything a few coats of white paint and let it dry. When everything was dry, I lined the wooden stand up with the bottom of the branch and marked where holes for the dowel rods should go. I drilled two holes into the branch and set it on top of the stand. 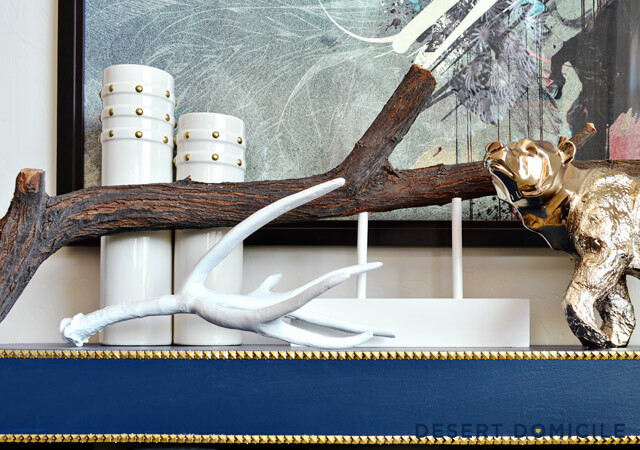 Note: due to the curved shape of our branch, it has to balance just right on top of the stand in order for it to stay in place but once it’s balanced, it doesn’t move. I love layering blankets over the back of our couch and on the arms of our chairs. In the fall, I replace the thinner blankets for thicker ones because I love how cozy they look and how the swap refreshes the space for the new season! 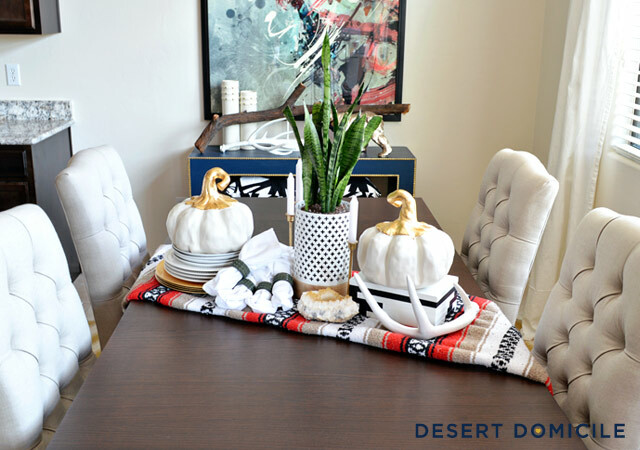 Speaking of blankets, last year I used my favorite Mexican blanket as our fall table runner (seen above) and the year before that, I used a twin sized duvet cover (seen below)! I love using what I have (blankets) instead of buying something else (a new table runner) that will only be used for a few months. To me, fall is kind of like the calm before the holiday storm. You haven’t been invited to, or asked to host, a formal holiday dinner yet (I’m assuming) so why not keep things casual until then? 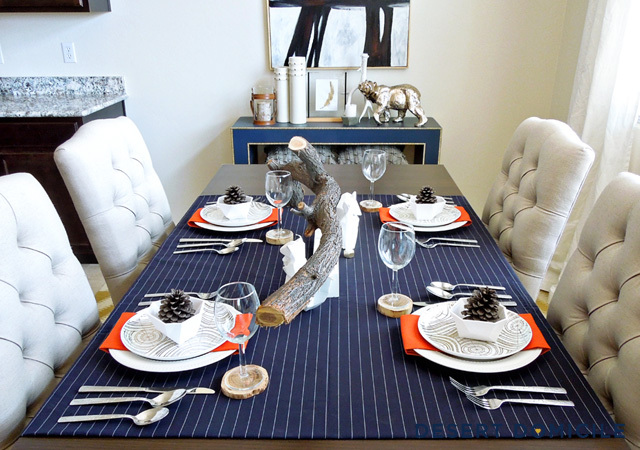 Stack your dishes and pile up your silverware and napkins so you can serve dinner family-style! 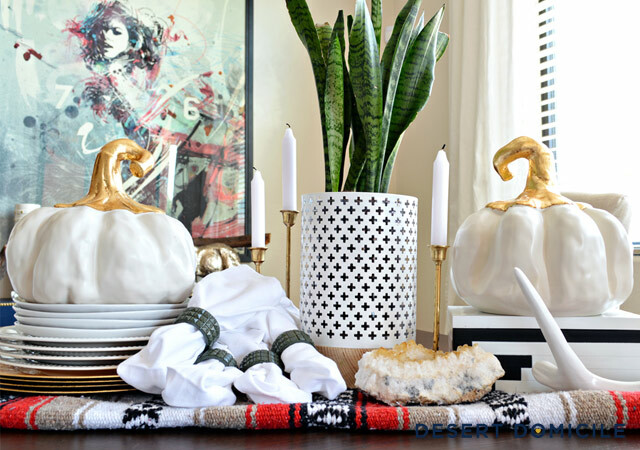 This is my favorite trick for making your home smell divine during the cooler fall days! Grab a bag of whole coffee beans, a glass jar candle in your favorite fall scent (pumpkin, vanilla, cinnamon apple, etc. ), and something to corral the two (I used a metal wing). Place your glass jar candle in the center of whatever you’re using to corral it and then pour the whole coffee beans around the base of the candle. 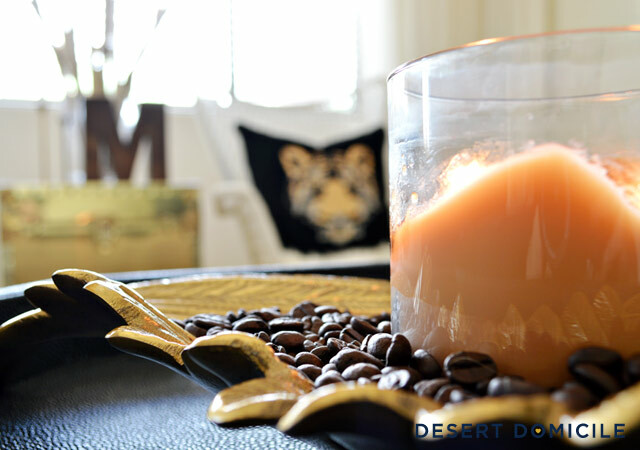 When the candle is lit, the heat from the glass jar will warm up the coffee beans releasing their aroma into the air! Great tips. This is very useful to decorate my house. Thanks for sharing.